The year of 2013 marks one to remember for Albertans. 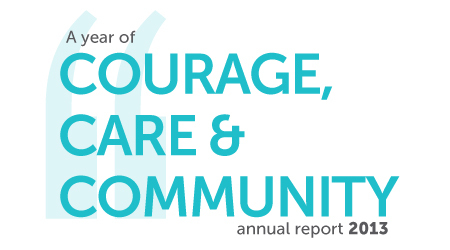 Our annual report was inspired by the transforming experience our community went through with the flood. It was a traumatic event for those directly and indirectly affected. But with all the challenges and heartache the floods brought, our community, in true Calgarian spirit, showed their true colours of courage, resilience, care and support. Feelings of hopelessness were combated with acts of extreme compassion, sincere kindness and the strongest sense of coming together. Our city became one. And we, at the Centre, feel very fortunate to have supported many people in need. As a member of our community for over 50 years, Calgary Counselling Centre was there while the waters rose and have continued to provide flood support and support for the mental health needs of individuals and families. We want to take a moment to recognize the significant role our outstanding staff played over the past year. During the challenging times of 2013 our staff kept us grounded, kept us strong and helped us do what we do best – support the community in times of need. The floods showcased Mother Nature at her worst, but humanity at its best. We feel honored to have helped our community through times of loss, devastation and hopelessness. And we look forward to continue to serve our community and our clients, whenever the need arises.